FRISCO — Recruiting doesn’t die, even in a dead period. The Opening Final is built to showcase the best talent from across the nation. A total of 25 Texas high school football players are at the event, including a trio of Austin-based wide receivers with Texas offers. It’s a four-day event filled with old-school combine testing, one-on-one drills, a 7-on-7 tournament and a linemen challenge. Despite the 25 Texans, the lone UT commitment here hails from California and he’s using the time in Frisco to bond with, what he hopes, are future teammates. 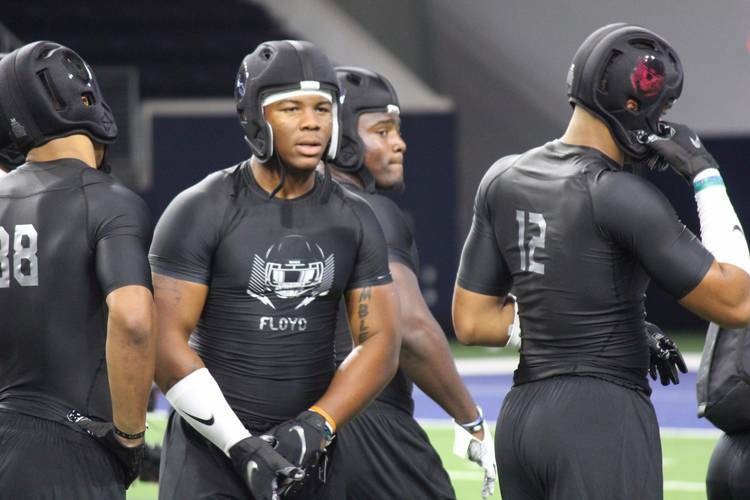 Four-star outside linebacker De’Gabriel Floyd is recruiting the likes of Bru McCoy, Rian Davis, Trey Sanders and Noah Cain. Texas picked up a commitment from fellow California native Chris Adimora, a close friend of Floyd’s. His defensive targets are Davis and McCoy, both fellow linebacker prospects. McCoy can also play wide receiver, but Floyd wants the out-of-state trio to join forces at linebacker in Todd Orlando’s speed-centric defense. Floyd ran a 4.7 40-yard dash and is set to play Rover wants he arrives at Texas. The Longhorns now hold two commitments from California prospects in the 2019 class. This after signing quarterback Cameron Rising in the 2018 class. Tom Herman has roots in California and he’s using those to lure big fish to the Lone Star State. Noah Cain was a one-time star at Denton Guyer before moving to IMG Academy (Fla.) and sharing a backfield with Trey Sanders. The two 2019 prospects split carries and are considered two of the top four running backs in the entire class. Neither has released a top list or taken official visits, but Texas is a school that is in the mix for both players. Cain plans to narrow his list to five schools in the coming weeks and then plan his official visits. He’s not planning on making an announcement until national signing day. The Longhorns are among the favorites along with Georgia, LSU and Ohio State. Cain was born in Louisiana and raised in Texas. If Texas does land Cain, a bulk of the credit will go to assistant coach Stan Drayton and the influence of Herman in Cain’s recruitment.